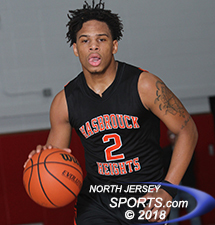 Anthony Palmer hit six 3-pointers on his way to a game-high 26 points for Hasbrouck Heights, the No. 6 seed, which beat No. 3 Emerson, 58-44 in the North 1, Group 1 state sectional quarterfinals. EMERSON – The team that can force its favored tempo has a distinct advantage in state tournament games. A team that can change speeds at will to suit game situations is going to be an even tougher out. That describes Hasbrouck Heights, the No. 6 seed in the North 1, Group 1 state sectional tournament, which sped the game up early on the road on Wednesday night and then slowed it down later to subtract possessions from No. 3 Emerson, which needed as many as it could get to try to mount a comeback. Heights played a technical masterpiece and led wire-to-wire in a 58-44 victory that puts the Aviators into Friday night’s state sectional semifinal where it will get a home game after No. 7 New Milford came from 17 points back to upset No. 2 Bogota. Emerson won the opening tap, but Hasbrouck Heights’ Anthony Palmer made a steal and turned it into a layup at the other end to give the Aviators the lead for good just 17 second into the game. Josiah Purdie’s steal and layup gave Heights a 14-7 lead before settling for a 14-11 advantage after the first quarter. 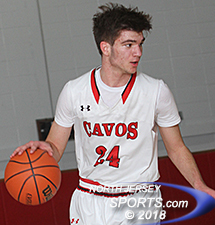 Emerson got as close as 17-15 after Pete Durocher and John Dime scored back-to-back baskets, but every time the Cavos threatened, Heights had an answer. John Dime finished with a team-high 18 points for Emerson. Palmer scored five straight points and Purdie added a steal and a layup and then Palmer set up Matt Moretto for a layup with a behind-the-back pass to turn a two-point lead into a 26-15 spread that Emerson could only cut by one before the halftime buzzer. Palmer, who loves that spot just a step or two to either side of straight on at the top of the key, made six three-pointers in the game and one of them opened the third quarter scoring. A bucket by Moretto on the fastbreak pushed the Aviators lead up to 31-16 less than a minute into the second half in front of the nattily-attired Emerson student section, which was in full throat even with its favorite team trailing all night long. Emerson had its best stretch of offense right after Palmer’s third three-pointer of the night when it committed to making sure junior John Dime got sufficient touches. Dime, the Cavos’ leading scorer, went on a personal 8-0 run over the course of 2:27 to get Emerson back to within 31-24 with 4:19 left in the third quarter. Josiah Purdie scored 13 points for Hasbrouck Heights, which will host 7th-seeded New Milford in the semifinals. Then Palmer hit another trey from his sweet spot and Purdie connected from deep 27 seconds later to end the run and, pretty much, the game. Emerson closed the third quarter with five straight points to get back to within 37-29, but Palmer banged another three to open the fourth quarter and the Cavos never got back inside double digits the rest of the way. Dime (18 points) was the only Cavo to reach double figures. Durocher added nine, but no other Emerson player made more than two field goals. Emerson made just two three-pointers in the game and both of them came in the fourth quarter with the outcome pretty much already decided. Palmer finished with a game-high 26 points, Purdie added 13 and Moretto (12 points) stepped up to be that all-important third scoring option. 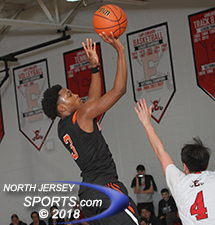 Kunga Tsering added four fourth quarter points and James Klenk made three fourth quarter free throws to round of the scoring for Hasbrouck Heights, which will head into the semifinal home game with plenty of confidence.